Are you looking for Ammiales, Blasiales, Familles, Lahmiales, Sabiales, Tamales, Tapiales, or Zambales? What does Lamiales mean as a name of something? Lamiales is an order of Magnoliopsida. 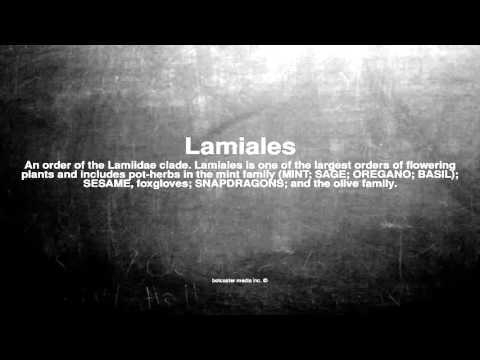 Lamiales is an order of lamiids. Lamiales is an order in the asterid group of dicotyledonous. (order Lamiales) A small family of 1 genus and 6 species of *herbs, *shrubs, and *subshrubs that have *alternate *simple leaves covered with glands that secrete a sticky substance that traps insects. Lamiales ( corolla usu. 2-lipped, hypog., rarely regular ; sta. as in preceding ; ovary 2 — 4- loc. Many C4 plants Cornales Ericales Icacinales Metteniusales Garryales Solanales Gentianales Boraginales Lamiales Aquifoliales Asterales Apiales Dipsacales Asteraceae Angiosperm Phylogeny Website Version 13, accessed 24 .viii.2015. — Lamiales Newslett. 5, 8-9. Goliaris, A. & D. G. Roupakias, 1997: Yield performance of interspecific F, hybrids of the Greek mountain tea, Sideritis spp. Lamiales lamprey Lamiales Botany, an order of dicotyledonous plants of. What does Lamiales mean in English? The value of this 8-letter word is 10 points, but it's not an accepted word in the Official Scrabble Players Dictionary. See also the blanagrams of Lamiales! Go to the thesaurus of Lamiales to find many related words and phrases!